The word cancer elicits many different feelings for people – fear, helplessness, and uncertainty just to name a few. Sadly, our fur babies aren’t immune from the grips of “the big C” but everyday we are learning more thanks to the efforts of researchers and board-certified veterinary oncologists. One of the most commonly diagnosed cancers in the dog world is lymphoma (7-24% of all dog cancers and 83% of all blood cancers in dogs). This week I have dedicated time to raising pet parent awareness about this cancer. It’s time to let a little air out of the balloon of fear that often elevates this cancer onto a pedestal on which it doesn’t deserve a place! Lymphoma – What is it? 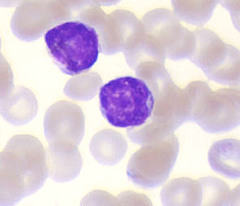 The term lymphoma (aka lymphosarcoma) is used to describe a type of cancer involving a specific white blood cell called a lymphocyte, as well as lymphoid tissue. Lymphoid tissue can be found throughout the body, including in lymph nodes, spleen, liver, bone marrow, and digestive tract. Lymphocytes are a part of the immune system that protect the body from infection. There are two general types of lymphocytes – B cells and T cells – and both have been implicated in lymphoma. Lymphoma – What causes it? Lymphoma – What does it look like? The clinical signs of lymphoma vary depending the type of lymphoma with which a patient is living. Multicentric – Patients living with this form of lymphoma commonly have painless enlargement of peripheral lymph nodes. Indeed, this lymph node involvement is often an incidental finding during a preventative healthcare examination. However, some dogs are sick with a variety of clinical signs including loss of appetite, weight loss, difficulty breathing, increased thirst, and increased frequency of urination. Mediastinal – This form of lymphoma commonly causes patients to have difficulty breathing. Affected patients may also develop swelling (edema) of the head, neck, and/or forelimbs. Alimentary – Patients with this form of lymphoma commonly have clinical signs referable to the gastrointestinal tract, particularly vomiting, diarrhea, weight loss, loss of appetite, increased thirst, and increased frequency of urination. Cutaneous – Lymphoma of the skin typically starts as dry, red, flaky, and itchy patches of skin. However, as the disease progresses, patients develop reddened ulcers, nodules, and/or plaques lesions on the skin. Extranodal / Central Nervous System – The clinical signs for this form of lymphoma depend on the site of disease. Patients with lymphoma in the central nervous system may be profoundly weak or paralyzed; they may also have seizures. Patients with lymphoma in the eyes can have visual impairments. Those with bone lymphoma may limp, have difficulty finding a comfortable position, and self-restrict their physical activity. Lymphoma – How is it diagnosed? There are several methods for obtaining a definitive diagnosis of lymphoma, ranging from non- and minimally invasive techniques to more invasive surgeries. Most commonly a veterinarian will perform either a fine needle aspiration or a surgical biopsy. What’s the difference? Fine Needle Aspiration (FNA) with Cytology: An FNA is inexpensive and easy to perform. There is low risk to the patient, and sedation is typically not needed. A veterinarian uses a needle that is the size used to give a vaccination, so there is essentially no discomfort for the pet. Lymph nodes, as well as internal organs, can readily be aspirated under most circumstances. Samples are then evaluated by a board-certified veterinary clinical pathologist – this evaluation is called cytology. 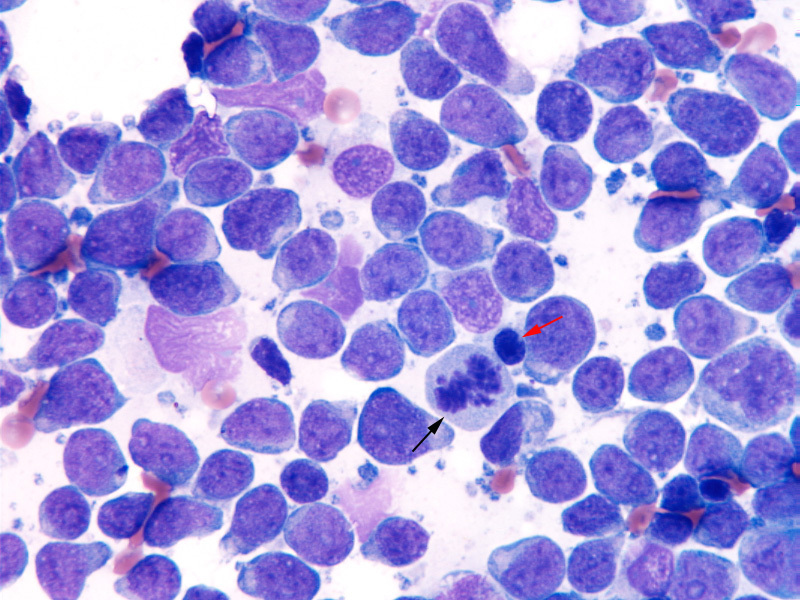 Unfortunately, cytology is not a perfect – it is not always accurate! Board-certified veterinary oncologists and internal medicine specialists perform FNA procedures routinely. Partnering with one of them can be quite helpful for maximizing obtaining a diagnostic sample. Surgical Biopsy: Given the potential limitation of aspiration with cytology, occasionally a surgical biopsy of affected tissue is required to obtain a definitive diagnosis. A biopsy is a minor surgical procedure to remove a piece of lymph node or other organ affected by cancer. In general, the larger the biopsy sample, the better the chance for an accurate diagnosis of lymphoma. Many family veterinarians are comfortable performing the necessary biopsy procedures. With that being said, partnering with a board-certified veterinary surgeon can be invaluable for ensuring the most appropriate tissue sample is obtained. Lymphoma – How is it treated? Lymphoma, in general, is most effectively treated with chemotherapy. I understand that word elicits intensely negative feelings in most of you. I get it. Yet please try to understand chemotherapy for pets is remarkably different (read better) from anti-cancer treatments for humans. I previously dedicated some time discussing this important difference – please read more by clicking here. In addition to chemotherapy, some patients benefit from other forms of therapy, including surgery and/or radiation therapy. Currently, anti-cancer protocols associated with the highest rates of remission (70-95%) and longest overall median survival times (9-14 months) involve combinations of drugs given over several weeks to months. Median survival time means 50% of patients will live beyond this time point and 50% will die before reaching it. Dogs with multicentric lymphoma treated with the most aggressive anti-cancer drug protocol have an average survival time of one year, and approximately 20% live longer than two years. Consultation with a board-certified veterinary oncologist or internal medicine specialist is instrumental in selecting the best chemotherapeutic plan for your fur baby. Unfortunately, most dogs will experience a relapse of their cancer at some point. Achieving a second remission is possible, but it is usually of shorter duration than the first remission because the cancerous cells become resistant to the effects of chemotherapy. Eventually most lymphomas develop resistance to all chemotherapy drugs, and dogs with lymphoma die or are euthanized due to an unacceptable quality of life. Lymphoma, a cancer of a type of white blood cell called a lymphocyte, is one of the most common cancers that afflicts dogs. Any organ of the body may be affected, and clinical signs vary depending on the site(s) involved. This cancer is most effectively treated with chemotherapy, and many patients will achieve remission with treatment. Partnering with a board-certified veterinary oncologist or internal medicine specialist is uniquely beneficial to ensure your pet is diagnosed and treated accurately, efficiently, and effectively. To find a board-certified veterinary oncologist or internal medicine specialist, please visit the American College of Veterinary Internal Medicine.